Today is my last post as a Design Team member for QKR Stampede. Maribeth also owns Biblical Impressions and Eureka! stamps and invited me to stay on. I agreed to work with Biblical Impressions line and my first post will be Friday for our first Biblical Impressions blog hop. 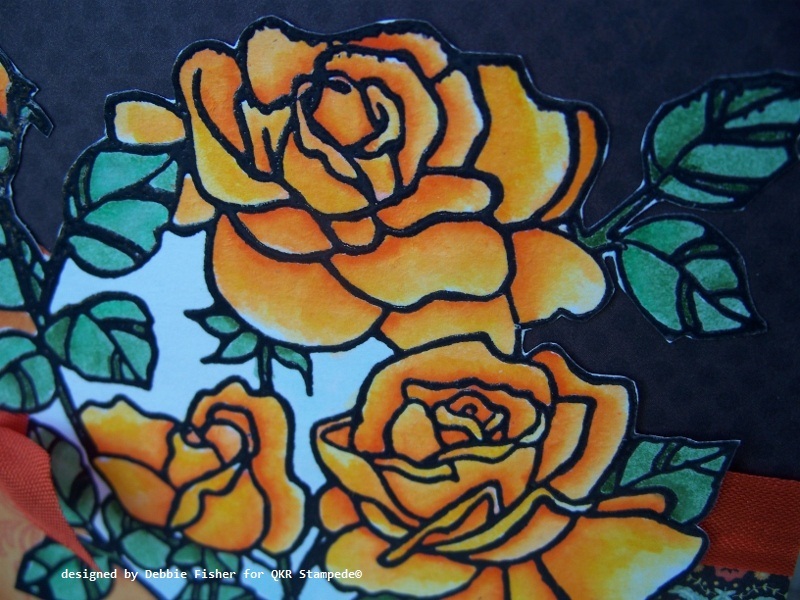 For this card I stamped in black and embossed with QKR's Large Roses stamp. 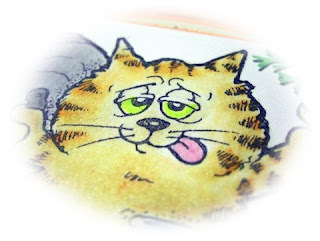 This image is 4.5" x 4.5". 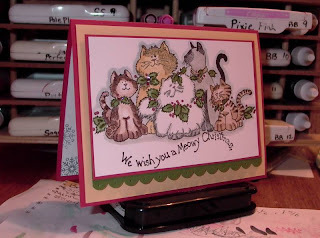 I stamped it on Georgia Pacific white paper and colored with Tombow Dual Brush Tip markers and blending pen. Papers are from My Mind's Eye and ribbon is some that my bestest online friend Michelle sent me. The color was PERFECT! By coloring and blending on paper that isn't watercolor paper you get a little bit of "peeling" with the paper. I love how this give texture to the flowers and makes them look real! My card is 5.5" square. As you enjoy your day of shopping, stamping, BBQing, or what ever you are doing...please don't forget to take a moment to remember what today is about! Thank You to those who paid the ultimate sacrifice for us and our country!!! In the spirit of the day I made this patriotic Tag Card to share with you. 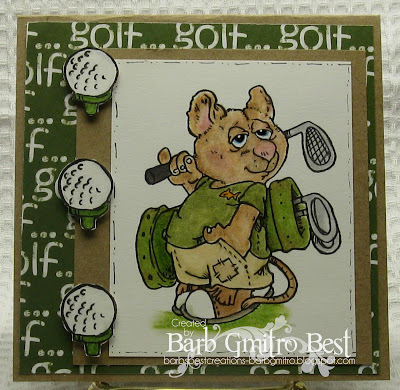 I started off with a "Slash Pocket with Tag" die cut from Creative Cuts & More. The pocket is cut from white Neenah smooth and the tag is cut from Typhoon Blue Bazzill Canvas Cardstock. I used killer red tacky tape to construct the pocket card and then adhered it to a 5 1/2" x 4 1/4" Red panel. 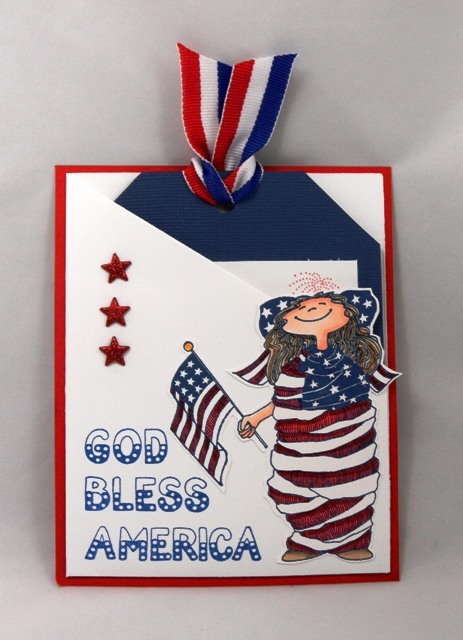 All the images are rubber stamps from Eureka Stamps. Thanks for stopping by and have a terrific Memorial Day! This tree from QKR Stampede can be purchased in three different sizes to suit your needs. This is the largest size and you'll find a store link to it below. This technique requires heat drying between ink applications and a gloss cardstock; 80% gloss was used but the technique has also been done on a high gloss cardstock. -Tear in half a piece of paper that’s larger than the image panel and form a mountain if desired. Mask off the sky area and direct to paper the mountains trying not to over saturate the paper with ink, but if it does leave marks above the landscape just move the mask higher and swipe again to cover the ink. -Use a second torn paper to mask the mountain area; the inks can overlap. 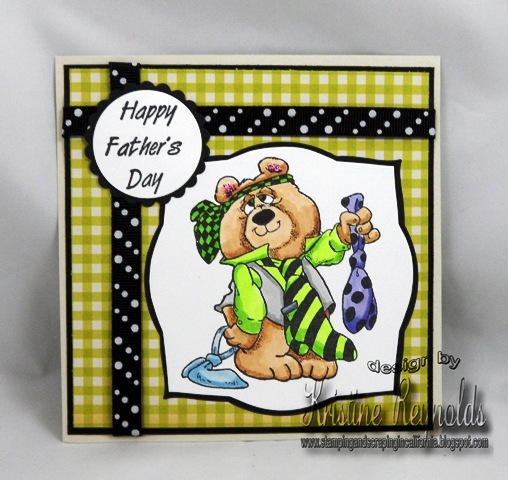 I used a combo of swiping and blotting to add the pink then used a sponge to add darker colors of the same family. -Stamp on the tree image with StazOn – Jet Black, and to blend the image into the landscape mask off using the image as a guide. Direct to paper the hill with StazOn. 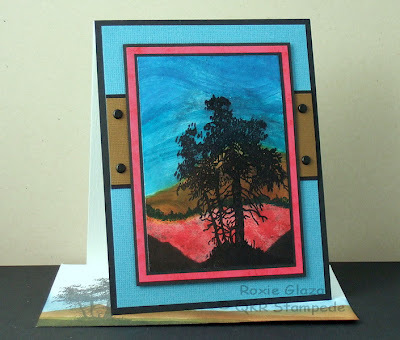 -To add a tree line at the base of the mountain I masked off the pink area and inked the very top of the tree image and stamped multiple times. 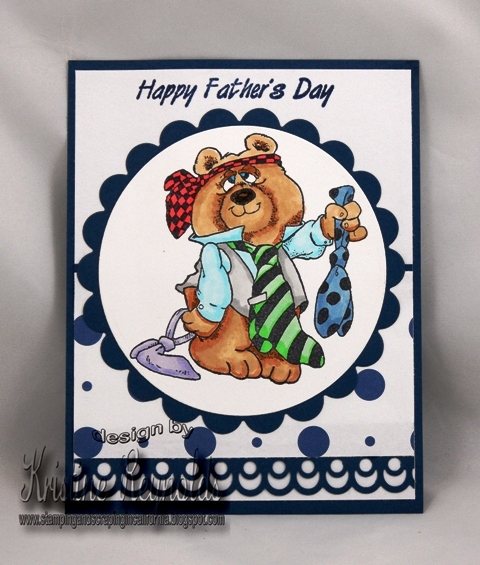 Just three more weeks till fathers day so I have another fun Father's Day card to share with you today. I just love this adorable bear image by QKR Stampede! Hope this helps you get inspired to get working on your father's day projects because with graduations, Proms, weddings, and everything else Father's Day will sneak up you before you know it! Thanks for spending a little of your day with us! Another cute bathing animal from QKR Stampede and I think they are all so cute. You can also find a bunny, bear, frog, turtle, dog. Paper Glaze was added to the bubbles and water on the ground. The clouds were added with chalks and sponge using my handmade template. 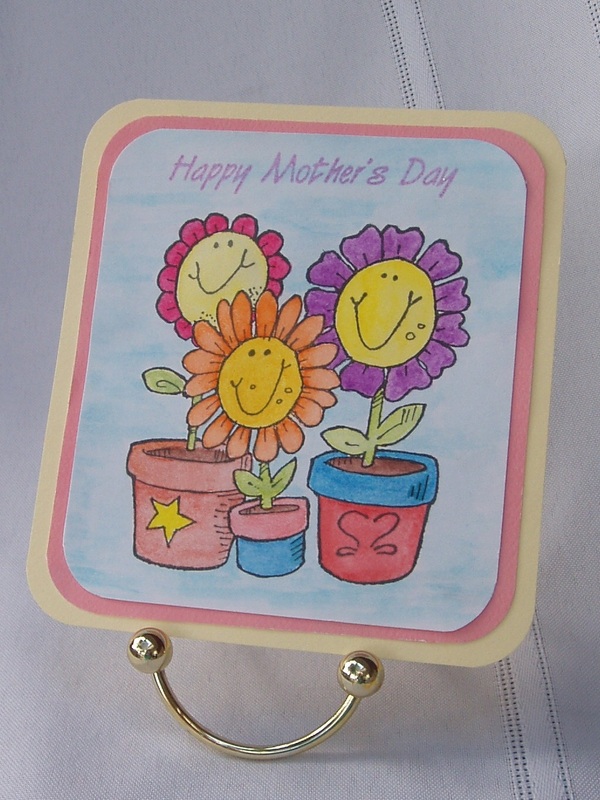 The punched flowers are from the Fiskars Flowers border punch, the centers are from a Sizzix button die. I cut ½” stripes to insert in flower punch and even smaller pieces to cut the flower centers. 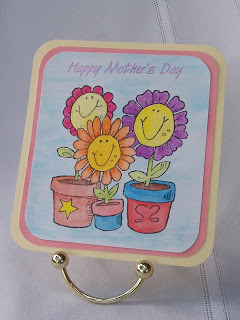 I pick the center up with a stick pin that is dipped in glue and place it on the flower, press down with the finger and pull the pin away, slide into place if needed, same procedure to add them to the card. Hi there. Hope you are having a wonderful week. Here in WNY state the weather has been rain rain rain...uggg I am sooo sick of rain! At least we have a gorgeous day yesterday. I was able to take my youngest DD to the park to check out all the baby geese. It really is neat watching the geese. Well today I wanted to share a card I made using the Little Boy image. I think this is one of the cutest "boyish" image. 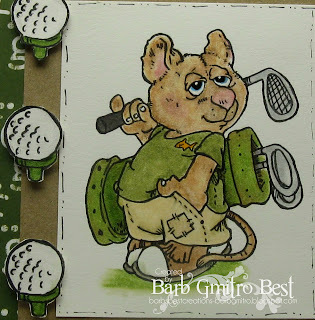 I stamped this guy on white CS and colored him with marker. I then pulled out an old Fisker's Texture Plate that has frogs and lizards on it. I ink distressed that after embossing. I layered that onto some PP from TAC, and then onto some navy blue CS. Last, I added some eyelets to the corners, and a sticker for a sentiment. I thought the idea of the froggie being a gift was perfect. That is what I always think of when I see this image. I can only imagine if I had a little boy he would show up bringing me "gifts" like this. LOL But, I only have little girls, so I get flowers (and lots of those lovely dandelions). Much better then bugs and frogs and lizards...lol. Have a great day! 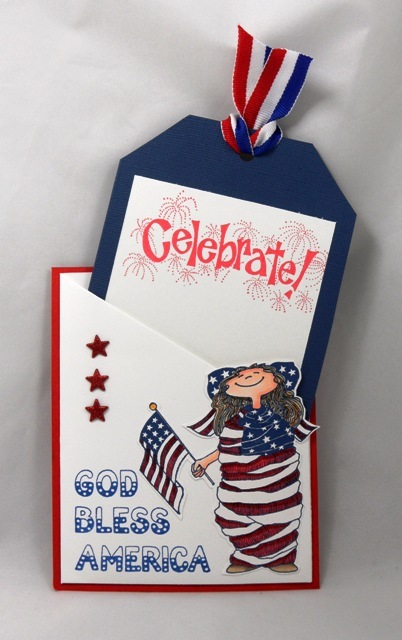 Yes CELEBRATE is what I did when I finished this card. Both the Heart Frame and the Rose Label were colored with Copic markers- Each image was fussy cut and were meant to be for two different card ideas. I had them sitting together and decided I really liked how they looked together. Green background paper is from my stash. Pearls from Pizzazz Aplenty. Card stock from CTMH- the flowers were handmade ny me using a Cricut cartidge-George Basic Shapes. Just had to share a close up of the details on this card. I wasn't sure I liked the color combo until I actually seen it together. Are these some fun images you think you could use? Pop in to QKR Stampede and check out all the fun images . It's Tuesday again and this is the date, on which I can show you something. In Germany we have just beautiful summer weather and as it likes to sit with a book in the garden and read. Since I do not like it when someone bending of the pages, I have a bookmark in every book. The need to not buy, the better, you make yourself a bookmark. 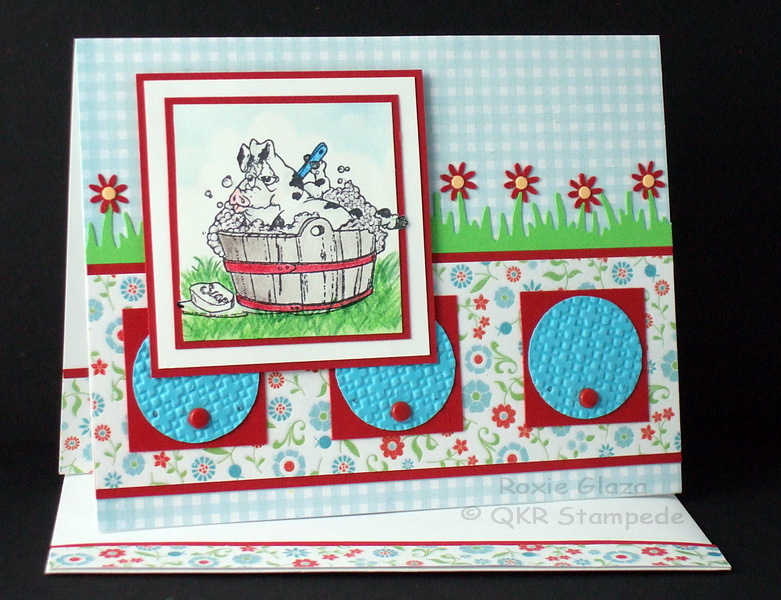 Here I would like to show you one that has been working with the cute stamp from the stamp shop QKR-Stampede. 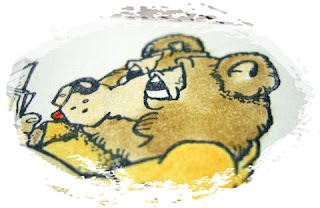 The name of the image is "Book Bear" and I think he's totally cute. I hope you had a great weekend! Did you enjoy our blog hop on Friday? If you missed make sure you go check it out because the design team made a bunch of beautiful flower projects for you to drool over! At the beginning of the hop you got a sneak peek at todays card but we never revealed the entire card. Here's the whole card for you now! A bright fun, springy card...hopefully it's a sign that Spring is here to stay!!! I got to meet the owner of QKR Stampede Maribeth Douglas and her husband last weekend at the Denver stamp show. They are both very nice. 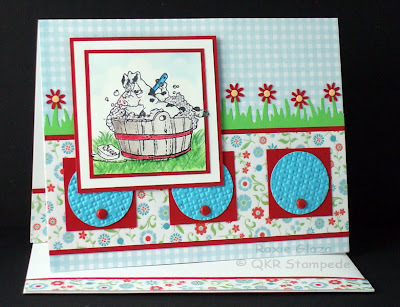 WELCOME to the QKR Stampede "May Flowers Blog Hop"! We are so excited to show you what we created for this FUN Blog Hop and SO glad you have come to join in on the FUN! I thought since it looks like spring is finally here in Western New York, I would bring that spring onto a card with these flowers. I used watercolor pencils to color the image. I embossed around he edges using my Score It. 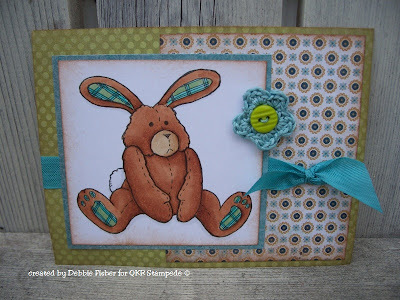 for our monthly QKR Blog hop. This month we will be featuring some of the fabulous flower images that QKR Stampede has to offer. Make your own flexible craft molds with our Make-A-Mold. 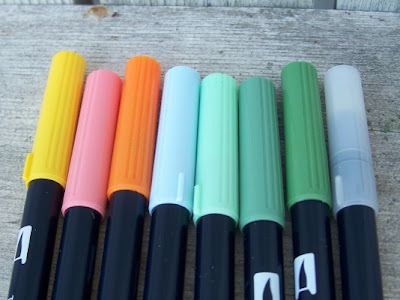 Fill with clay, soap, wax, low melting metals, UTEE, or Black Glue!! Add highlights with Powders and Pigments. Samples below are all done with Black Hot Glue. I wanted to share with you another way that I have used that Peacock Feather (#6301) Stamp from Eureka! Stamps. I needed a title page for the wedding scrapbook I was making and I wanted it to be pretty basic, but I wanted to have "Made with love by Aunt Kristie" on the page. The problem is that I hate my handwriting and thought it really took away from the look of the page. After hemming and hawing I decided to hide it. The peacock feather at the left of the page is metallic gold, printed on the page, so I thought I would use my Peacock Feather stamp to mimic that look. names. The base card stock for this page is also from that stack. I attached this piece at the top only, so it can flip up to read what is written under it. Sorry the close up picture isn't better, it is very tough to get a picture with out some reflection, you can see how shiny this metallic embossing is. Thanks for stopping by today. Please leave a comment and let me know what you think. I can't believe Mother's Day has all ready passed. Next on the card making list is Father's Day and it will be here before you know it. Instead of giving your favorite dad another lousy tie for Father's Day...give him a card with these fun tie images on it! Hope your weekend is off to a great start and that you will get some time to stamp! Prismacolor pencils were used to color the image and baby oil for blending. The flower the little mouse is holding was cut out and mounted on a 1/8” punched circle to create dimension. A plastic stipple brush was used to add texture to the solid colors. I used the deco pink pencil to add shading to the larger pink flowers. All the flowers were embossed, large pink from the back and the smaller ones from the front. 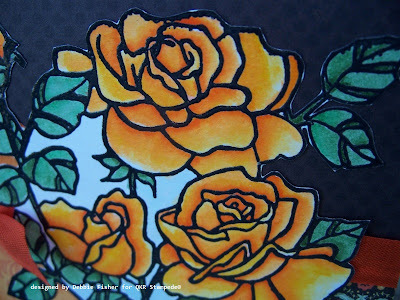 The black and yellow centers were cut with the Cuttlebug Tiny Tags die or a Sizzix button die. I cut or punch smaller pieces and place them over the holes for cutting. The flowers were assembled with Aleene’s tacky glue and to pick up the small centers I use a large stick pin - dip in the glue, touch the back of the circle to pick up, place on the flower, press down with the finger and pull the pin away, slide into position if needed. Stickles was applied to all flower centers and the flower and circles on the designer paper. The black nailheads were attached with Aleene’s Paper Glaze. After attaching the strips of paper to the insert and envelope I embossing double lines just above the paper with the Scor-Pal. Hi there. Sorry my post is a little later then normal for me. Time has been slipping away from me lately. I didn't even realize it was Thursday already! 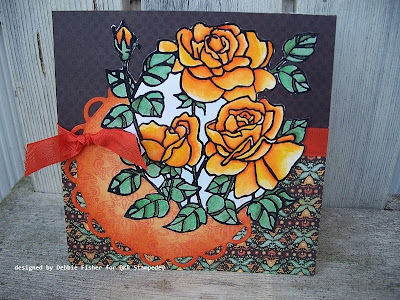 Well today I have a card using the Tulip Border stamp. I just love tulips...those and gerbera daisies are my favorite flowers. The tulips in my front yard are in full bloom too. So...I had to have this image. Here is a CAS card I made with it. I stamped the image and trimmed it down. I colored with watercolor crayons, and layered on to the green PP. The green is actually the back side of the tulip paper I used for the background. I cut another piece and added the rub-on to that. Like I said...CAS...but a cute card to pass to a friend. Well thanks for stopping by the QKR Stampede blog today. Be sure to stop on over to the QKR Stampede store and check out some of the other flower images! 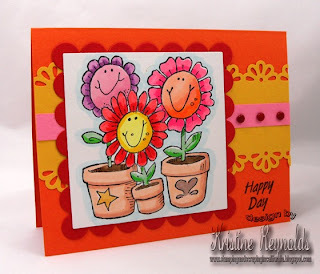 And...be sure to stop by next Friday for a flower themed DT Blog HOp!!!! 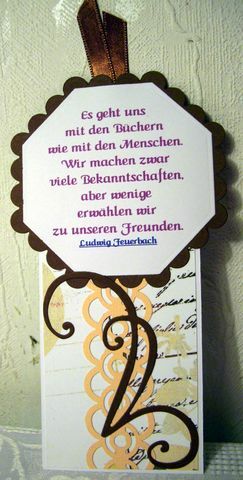 Today I have a couple cards to share with this great image. 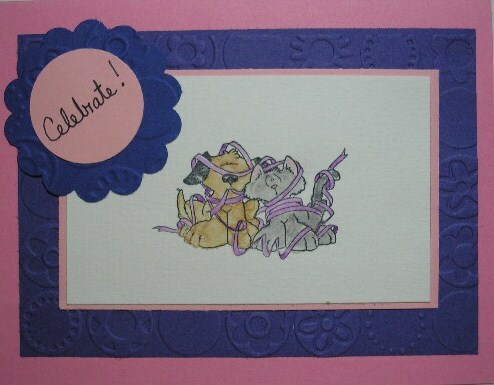 This first card using the 55602 Heart Frame was stamped and colored with Copic markers and fussy cut. The background paper and card stock is from CTMH . Lace is from Really Reasonable Ribbon. The red flowers are from Pizzazz Aplenty. I used many buttons from my stash and a little glitter in between the buttons. I just loved the coloring on this heart- it seems to show the depth I was looking to show on this image-I think this one does justice to the details of the image. The card stock and design paper is also from the same line at CTMH. I used a large flower and red/white twine from Pizzazz Aplenty. Brads from my stash. Today is the the second thuesday from may and it is time for me to show you a new card. 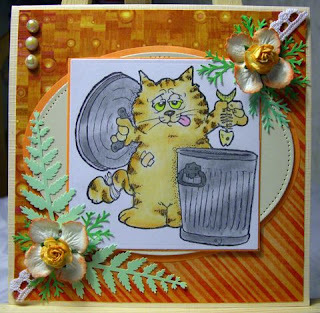 Alley Cat is the name of this fantastic stamp. For me, might say the cat "This is a difficult but fair fight was";-), looks battered and bandaged like a kitten. What for a wonderful image, I love it. Hello all you stamping friends! Today I'm showing you a scrapbook layout that I made for an album of my nephew's wedding. He and his lovely bride were married this past October and I decided to make a scrapbook for them. I have just finished it (sssshhhhhh! don't tell, they don't know about it yet) and on this page I stamped the Peacock Feathers (#6301) from Eureka! Stamps. They used peacock feathers for bouquets, boutonnieres, corsages etc. at their wedding and their colors were turquoise, brown and a bit of purple. This is the entire double page layout showing their invitations, directions and the recipe cards they sent to each guest. I also designed and made the recipe cards for them. Here is a closer picture of one of the feathers. I stamped it onto the page with Perfect Medium then used Perfect Pearls to color it. Perfect Pearls give it a wonderful shimmery shine. I am thrilled with the way they turned out. Thanks for stopping by today. I hope you like the way I have used stamping in my scrapbooking. 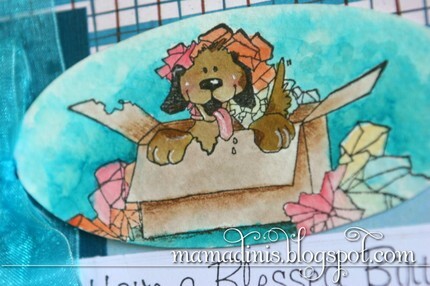 There are lots of ways to use stamps, not just for cards. Try some on your next scrapbook layout. Stop in at the Eureka! store and see the wonderful stamps they have to offer. I'm sure you'll find a lot of images that you will love. Hello! I'd like to wish y'all a Happy Mother's Day! Whether you are a mother or not, it's a day to celebrate Mom's everywhere. You may be someone's Mom, Grandma, Aunt, friend, teacher, whatever, but somehow I'm betting if you are female you have 'mothered' someone at sometime in your life. So Happy Mother's Day to you all. And I have a Mother's Day card to show you today too. 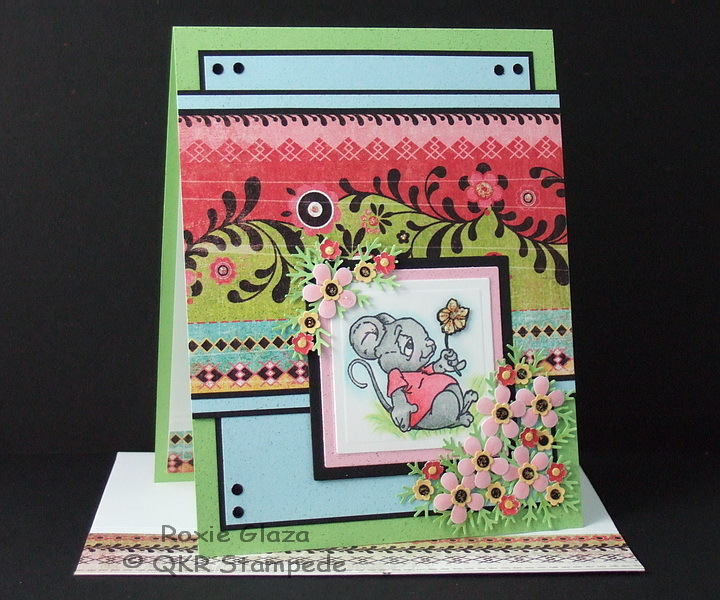 This card was made with the "Smiling Flowers" stamp (#17002) from QKR Stampede. The image was colored with watercolor crayons. For the background I used watercolor crayons, colored them onto an acrylic block and watered them down then applied them to the paper. I hope you will spend Mother's Day with happy memories and those you love. Thanks for stopping by today, stop in to the QKR Stampede store and see what fabulous images you can find to enjoy! 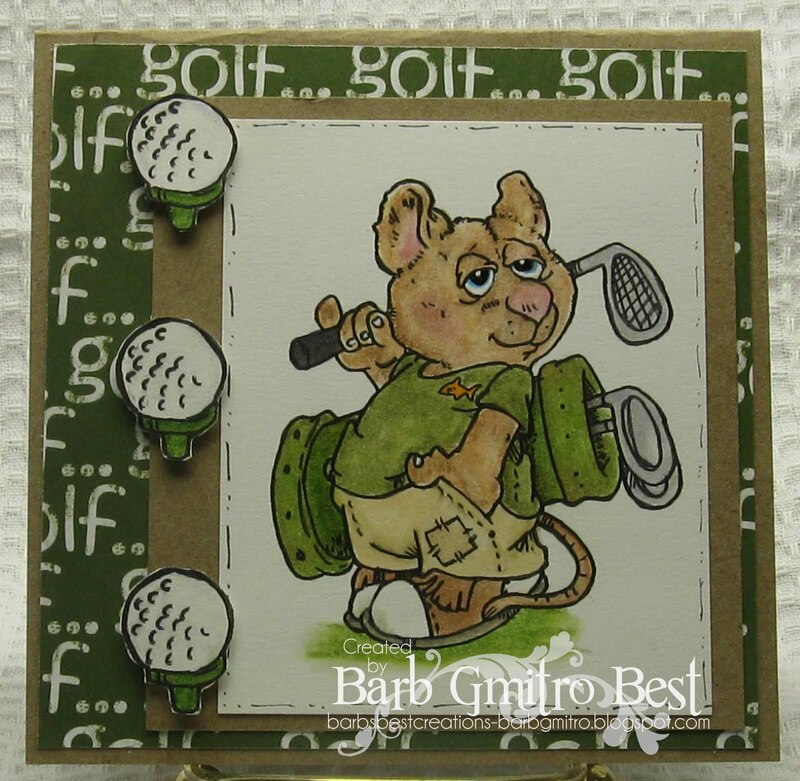 Golfing Mouse and Golf Ball. Just love this little guy! He's all ready for spring and golfing! I colored with colored pencil and blended with mineral spirits. The background paper was a lucky find at the craft store! It's from Scrappin Sports and more. I was so excited to find such a perfect paper! and attached them with mounting tape for dimension. This image is the same as this one that I created, but without the Happy Easter. 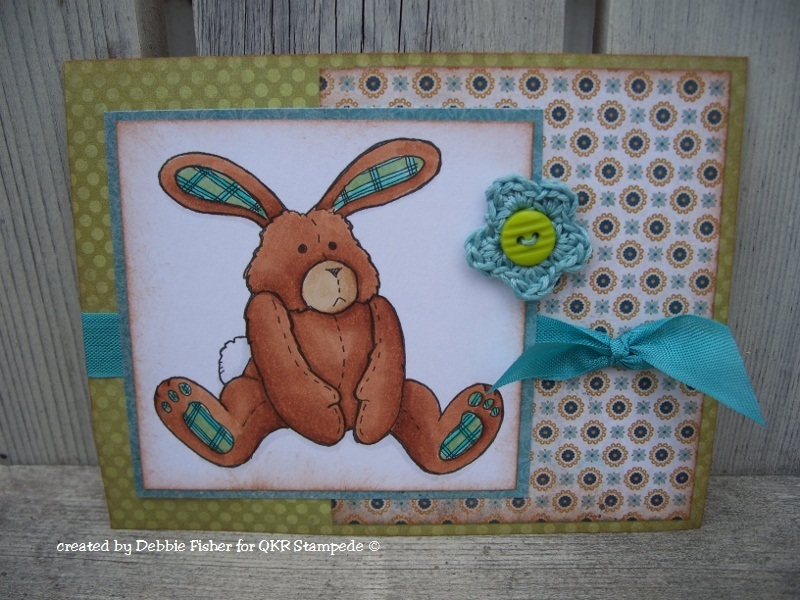 the name of the image is Happy Easter by QKR Stampede. 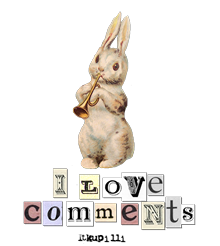 It's very easy to remove the sentiment in Paint when you use their digital image. I used more lovely paper by My Mind's Eye, one of my crocheted flowers and some vintage rayon binding. 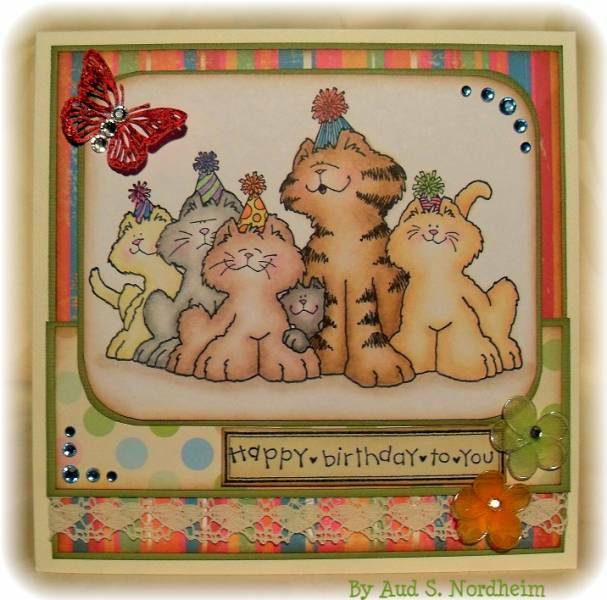 Some of the kitties and puppies unique to Eureka Stamps. 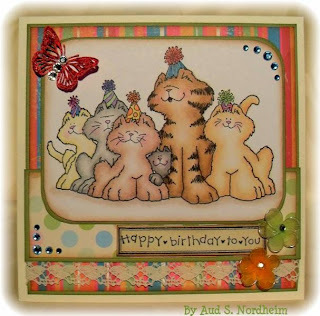 I LOVE the 3D pattern stamps with Eureka Stamps! At Eureka Stamps, some of the verses and quotes are designed so you can replace the first letter with a larger letter. We also have backgrounds and filigrees to go with the large alphabet letters.